Never get tired of doing the little things for others. Sometimes those little things occupy the biggest parts of their hearts. Never treat a women like she’s royalty. It’s not realistic and never lasts. Treat her like you want to be treated and she’ll always be by your side. Be faithful in small things because it is in them that your strength lies. Great things are done by a series of small things brought together. If you cannot do great things, do small things in a great way. Never get tired of doing the little things for others, Little Things Quotes picture/image is an Inspirational Stuff to Inspire and Motivate You. You can download pics by just clicking on the Images. Thanks for visiting Truth Follower an online place for huge collection of inspiring pictures, quotation, and Sayings Images. 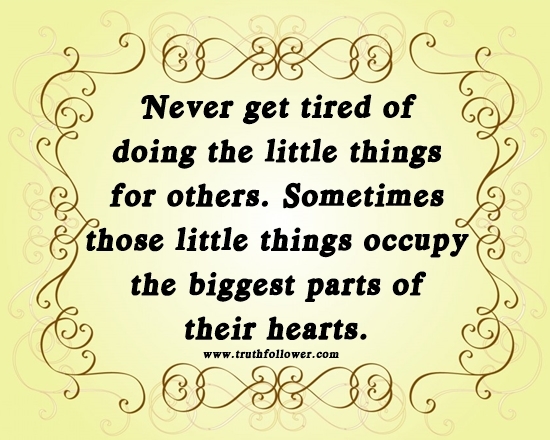 If you like Never get tired of doing the little things for others, Little Things Quotes, Please Share with friends and family on Facebook, Twitter, and Pinterest.